March 9, 2018--Took a moment to finish this into a Christmas ornament. 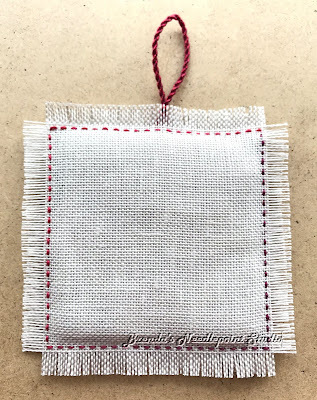 The instructions couldn't have been easier--stitch 2 pieces of linen together on 3 sides using a running stitch, make the cord for hanging, stuff a piece of batting between the two pieces of fabric, then finish stitching (catching the cord). All that's left is to remove some threads around the ornament--finished. May 10, 2017--This pretty little poinsettia is complete and all that needs to be done is turn it into an ornament. 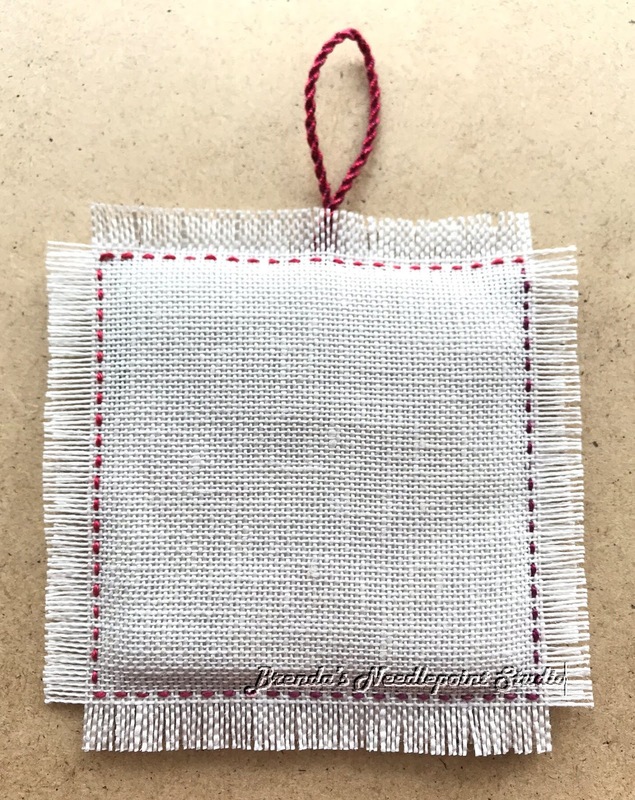 I really like the variations in the thread colors, but think the size used--Caron Wildflowers (perle 8 to 12 equivalent), is too thin and doesn't cover the linen as well as I would have liked. Maybe once it is pressed the thread will "flatten" out and cover more. May 4, 2017--I am nearly finished "cross stitching" a beautiful Christmas poinsettia called Shades of Christmas led by Bobbie R. of Delaware's Seashore Chapter, ANG. 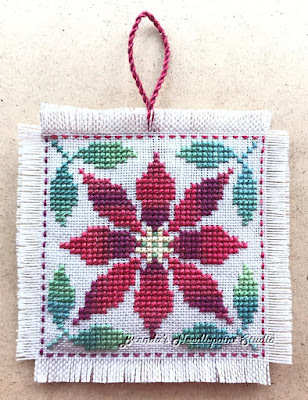 I am learning a little about cross stitching (this being my second chapter project) and like how pretty the projects are along with the challenge of counting stitches and thread color changes (I think the crosses are all going in the same direction). Once the green leaves are stitched, I plan on making this into a very simple ornament with fringed edges. This is a free chart designed by Crossing Montana for Eterna Silk. However, I'm using Caron Wildflowers for the threads. Love the variegations.